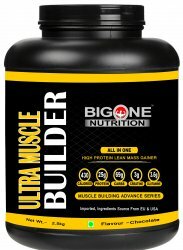 Mouzlo.com (a unit of Yash Nutrition Planet) is very pleased to offers Ultra Muscle Builder @11% discount Just Rs. 2,850 reaches to your door step with free and cash on delivery services. It is packed with 430g calories, 69g carbs, delivers 25g protein to build fat free muscle, loaded with 3g creatine and 3.6g glutamine. It formulated using ultra-refined content – imported from quality suppliers in EU and the USA; pre-checked ingredients; verified and tested under the watchful eyes of established and experienced nutritionists and formulators.